George Caleb Bingham was one of America's first important painters to specialize in genre paintings, which depict scenes of everyday life. His early years were spent in Missouri, and he knew at first hand the life of the frontier, especially the comings and goings of the boatmen who ferried cargo on the great rivers of the Midwest. Bingham's paintings were intended for audiences in eastern cities such as New York and Philadelphia, and the boatmen he portrayed were already by the 1850s emblematic of the rough and tumble characters who were pushing American civilization ever farther westward. They were also considered disreputable characters who were fond of drunken carousing in the towns they passed while enroute downriver. The men portrayed in Bingham's river pictures are usually young, but here we are presented with an older, scowling individual who looks out at us with undisguised ill humor. This solitary figure seems confrontational, even threatening, establishing a mood of unease that is unique in Bingham's work. Perhaps the nature of the narrative—an old man left to guard the cargo while his companions enjoy themselves in town—dictated he be depicted in this way. But Bingham, who was actively engaged in politics and who was staunchly antislavery, may have also intended the troubled visage of this boatman to be a mirror of the difficult times the nation was facing in the years leading to the Civil War. Art Union of Philadelphia, in 1851 (listed for sale, $60). found 1940s in Rhode Island by B.R. Leviss, Fall River, Massachusetts; (Vose Galleries, Boston); sold 1965 to John Wilmerding, then Cambridge, Massachusetts; gift 2004 to NGA. Catalogue of Paintings Now on Exhibition in Our Free Gallery, Philadelphia Art Union, 1851, no. 51. George Caleb Bingham 1811-1879, National Collection of Fine Arts, Washington, D.C.; Cleveland Museum of Art; The Art Galleries, University of California at Los Angeles, 1967-1968, no. 17. 19th Century American Art, Fogg Art Museum, Cambridge, Massachusetts, 1976, no catalogue. American Masters from Bingham to Eakins. The John Wilmerding Collection, National Gallery of Art, Washington, D.C., 2004-2005, no. 1, repro. Letter from George Caleb Bingham to James S. Rollins, dated New York March 30 1851; Folder 16, James S. Rollins (1812-1888), Papers, 1546-1968 (C1026, microfilm); State Historical Society of Missouri, Columbia. "Catalogue of Prizes to be Distributed on December 31, 1852." Philadelphia Art Union Reporter 1 (January 1851): no. 51. McDermott, John Francis. George Caleb Bingham, River Portraitist. Norman, Oklahoma, 1959: 416 (no. 58). Bloch, E. Maruice. George Caleb Bingham: The Evolution of the Artist. Berkeley, 1967: 106-107, 169, 302, 335. Bloch, E. Maurice. George Caleb Bingham: A Catalogue Raisonné. Berkeley, 1967: 76 (A-194), 234, 238 (postscript). Wilmerding, John. 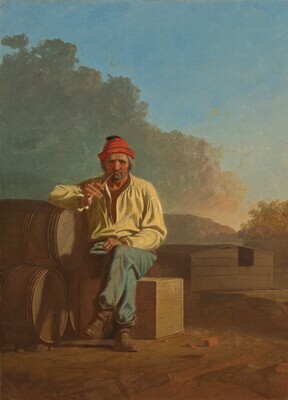 "George Caleb Bingham: A New Find." Antiques 152, no. 4 (October 1967): 556-557, repro. Bloch, E. Maurice. The Drawings of George Caleb Bingham: With a Catalogue Raisonné. Columbia, Missouri, 1975: 119, pl. IX. Bloch, E. Maurice. The Paintings of George Caleb Bingham: A Catalogue Raisonné. Columbia, Missouri, 1986: repro. 82, 190 (no. 225). Rash, Nancy. The Painting and Politics of George Caleb Bingham. New Haven, 1991: 246 nt. 67. Wilmerding, John. Compass and Clock: Defining Moments in American Culture. New York, 1999: 120-121, pl. 10. Kelly, Franklin. "George Caleb Bingham, Mississippi Boatman." Bulletin / National Gallery of Art, no. 32 (Fall 2004): 17, repro.